How to choose free, easy to use, extendable and good quality syntax highlighting control for .NET program? First, what i have try to use, was ScintillaNet, but i have no luck to get it worked in test program. It need to setup before use, require unmanaged companion library, what make difficult to multiplatform use. After all i see my Visual Studio C# 2010 Express very unstable, after adding ScintillaNet control to Toolbox. After many experiments i get it worked, but result seems unstable and unrepeatable. Personally i not recommend to use Scintilla in .NET application, but possible it good choice for C++ project. After searching i found editor control from a well known open source IDE SharpDevelop. Syntax Highlighting Text Editor Control looks very good and light after Scintilla. It requires less time to load and seems much more stable. First what need to do is add assembly reference to a project. Next you choose assembly and controls for Visual Studio Toolbox. After that you can put control to the Form. Surprising you will not see Property to choose syntax highlight schema. Instead of this you have to use method SetHighlighting. String parameter sets highlighting schema from available schemas list. These schemas embedded into control. ICSharpCode.TextEditor available under LGPL license, which means you can use this software component for free in open source or commercial application if you not made own modification to licensed component. What if list of embedded schemas is not enough for your application? You can add own, using files, as well described in article on SharpDevelop Wiki. But what if not like to waste disk space with multiple files or cannot use external files in your application? If you add new schema to control's assembly, according with rules of LGPL, you have to provide source of modified control. It can make problem for distributing in propiertary software. When we finish with provider we can embed schema files to application. 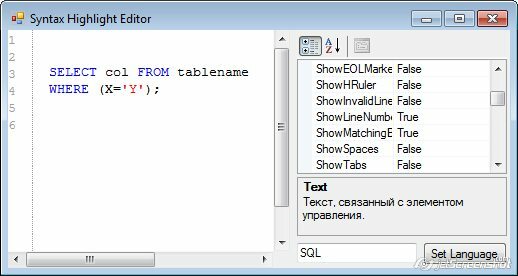 We will need at least two files: SyntaxModes.xml and schema file, SQL-Mode.xshd for example, if we provide SQL syntax mode. I add to project new folder, named Resources, add files and choose in Properties Build Action - Embedded Resource. File, containing SQL schema i took from Paul Kohler's MiniSqlQuery, released under the terms of the Microsoft Public License (http://pksoftware.net/MiniSqlQuery/). // Attach to the text editor. When you set highlighting schema, keep in mind, that name is case sensitive and should exactly match name described in schema files. The Editors Control for Windows Forms application is flexible data entry controls.